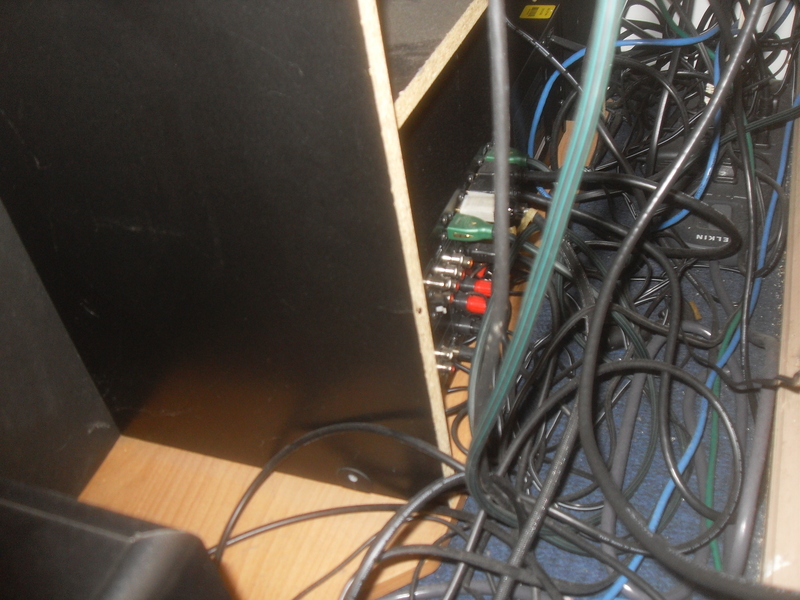 In a few of my posts I have compared the wiring in my head to the back of an entertainment center. I wanted to show you guys a picture that drives that point home. I present to you exhibit A, the rear of my entertainment center/home theater. Scary? I thought so and assuming that most people don’t know how home theater systems work then this must look super intimidating. Most people probably don’t know what any of these cables are or where they go or hook into. All you know is that it’s wired to work a certain way and that the wiring can’t exactly be tampered with or even altered. However since this is my home theater system and I’m the one who spent two and a half pain staking hours threading all of these wires and hooking them in the right places as well as connecting all the devices and hooking up all the speakers in the correct locations in the room followed by nailing all wires to the wall, I know not only how everything works but why it works the way it does. Because I understand the wiring as well as the functions of each wire, I can work around any limitations or problems that may exist as a result of the said wiring. If you’ve followed this home theater system analogy well then you already know what this analogy has to do with Autism. Us people on the spectrum have really complicated wiring in our head that causes us to respond differently to certain situations than the average human. From the outside looking in, no one can understand how we function or why we function the way we do. We however know why we do the things we do and why we respond and approach situations the way we do. To us the wiring in our brain is perfectly fine, to us everything is where it needs to be so why go through the trouble of explaining it right? Very few people on the spectrum acknowledge that the wiring in their brain is different and because of this they can easily work around the differences in their wiring through friendly coaching and practice. However not all people on the spectrum can easily adjust themselves on their own and thus it’s your job to learn which wires in a person’s brain are crossed and learn how to convey information to them in a way that’s suitable for their current wiring. The goal when conveying information is to work around the confusing wiring rather than against it. To work against the wiring is to approach them as everyone else and assume that the wring will readjust itself. This is a recipe for failure and will set you up for a serious quagmire in the long run. Catering to the current wiring will get you the best results as far as responsiveness goes. I hope that this picture has given you a better idea of how I view my head and how you should look at the head of everyone on the spectrum. Hopefully this approach will help you when it comes to understanding someone on the spectrum. Those who can actually convey to you how they view the wiring of their head will probably use a different analogy but no matter what the analogy you should always be prepared to work with they way their brain is wired in order to better help those on thew spectrum. Stay classy people. This entry was posted in Down The Rabit Hole and tagged autism awareness, brain, home theater by flem0328. Bookmark the permalink.